Hello friends and fellow lovers of blue and white, time for our monthly meeting for all of us incurable blue and white aholics:) I started this online “club” for those of us who simply cannot get enough of blue and white. I am living proof of that demographic. 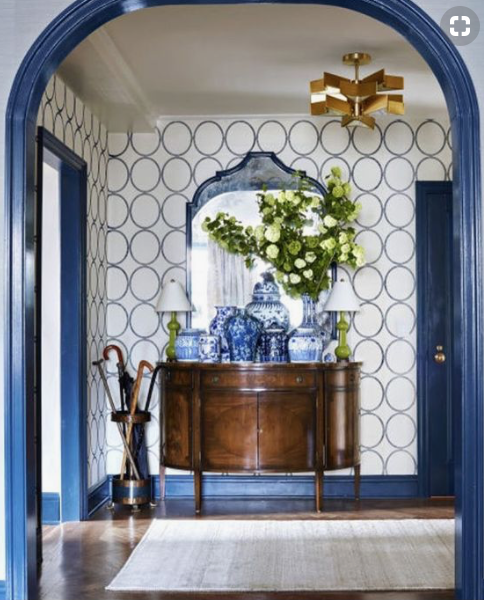 I love to look at all the ways this beloved color combination is used and let’s face it, don’t know when it has experienced the surge in popularity as it has now. It is everywhere! This is simply striking, bold but in the best way possible! 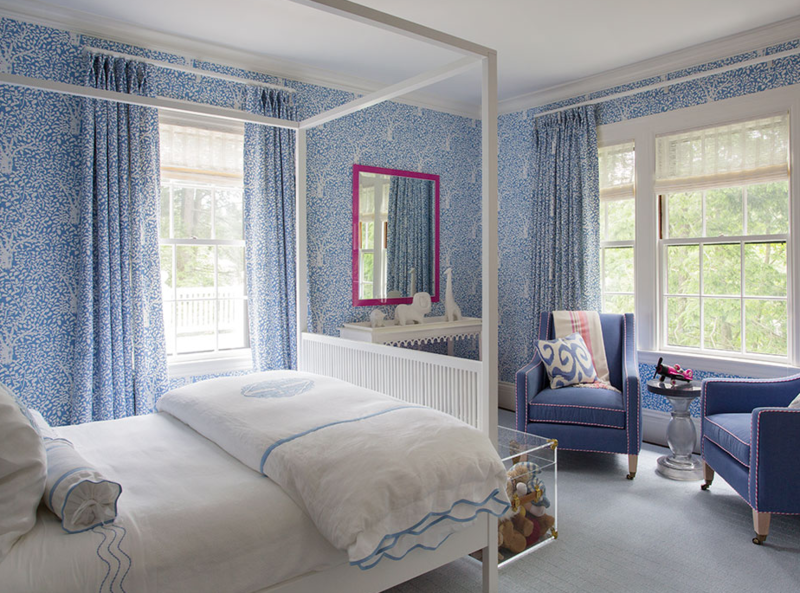 Must say I love it in Draper James, done by Mark D. Sikes…so fresh and crisp! 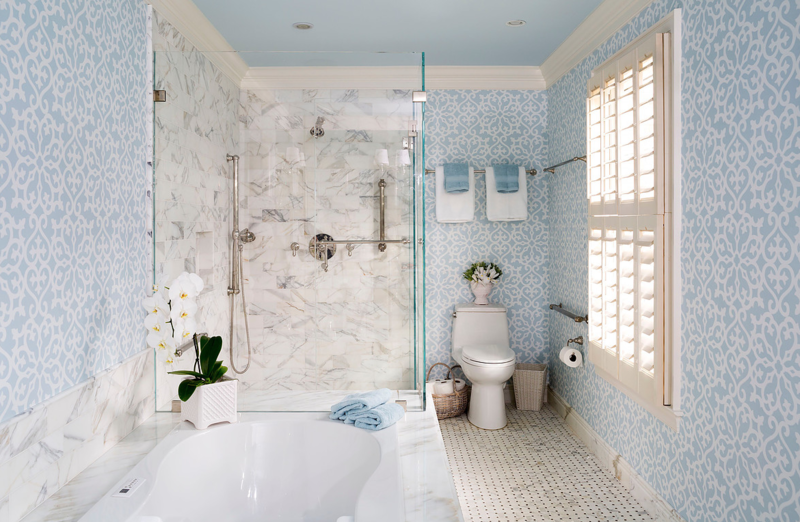 Love a white bath with blue and white paper, this is giving me an idea! 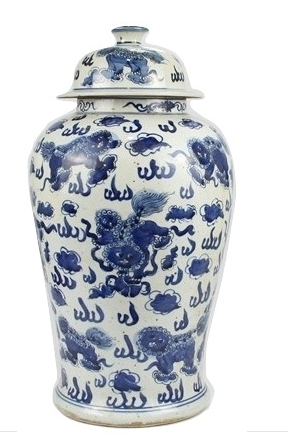 Measures 18″ x 11.5″ today $110! Whoa! That is a lot of blue and white beauty to take in. Now it’s your turn to weigh in, I want to hear what you have to say on the matter, do you love it? Are there limits to where you might use it? Do you favor the softer tones or the bolder looks? 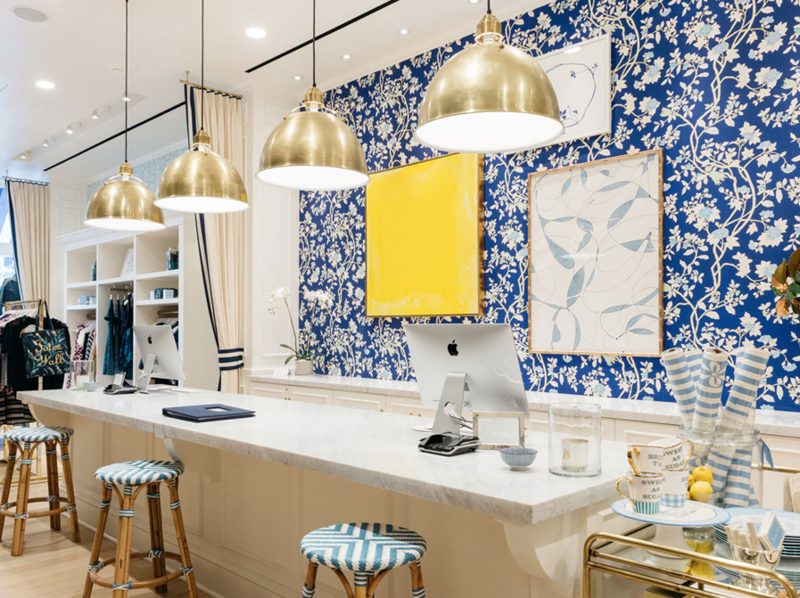 I am suddenly dreaming of blue and white wallpaper and going to go on a new search though I already have a few fantastic options. 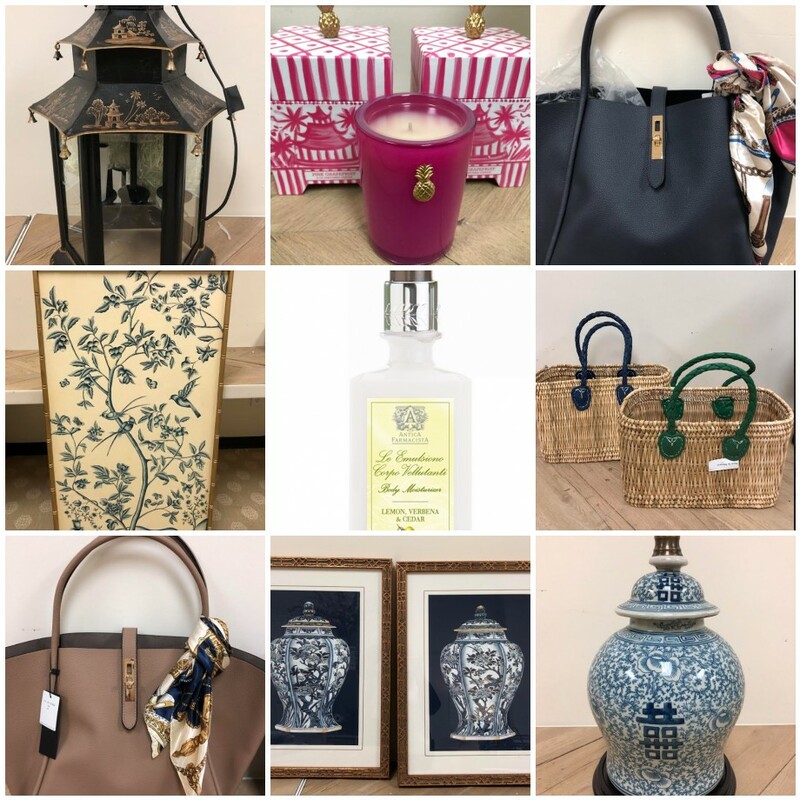 Some favorite companies would be Quadrille, Thibaut and Schumacher, also saw a few recently from Sister Parish that I really liked too. Let’s get this meeting started, can’t wait to hear what you have to say on the matter! Until next time……. Gorgeous! Every room is more beautiful than the next. What is the source of the 4th picture? Love that wallpaper! 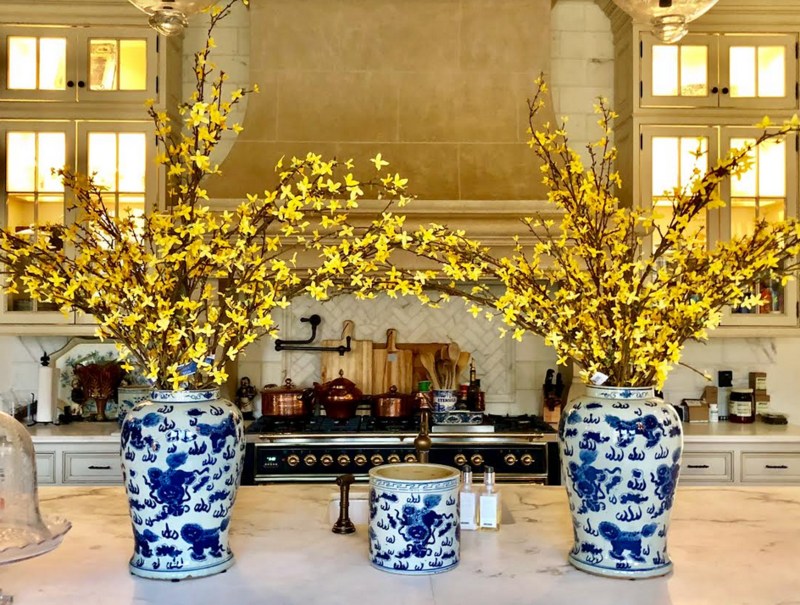 I love the foo dog planters! No limit to where I would put them-just beautiful with forsythia in them on the kitchen island. I favor both the darker and lighter colors together. 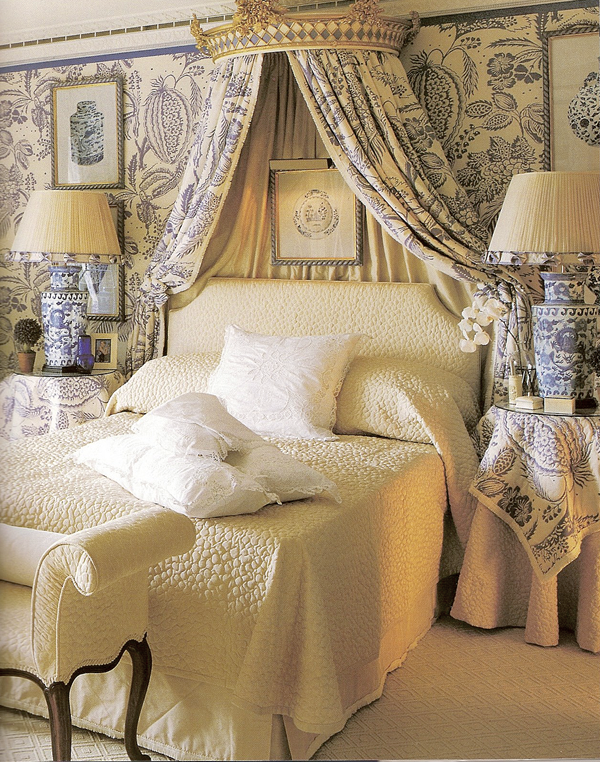 Some of the bedrooms featured in the post are to die for! Count me in as a member of the blue and white club! Very enjoyable! As good as a slice of homemade pie! All of the rooms are beautiful. I do prefer the more muted tones. 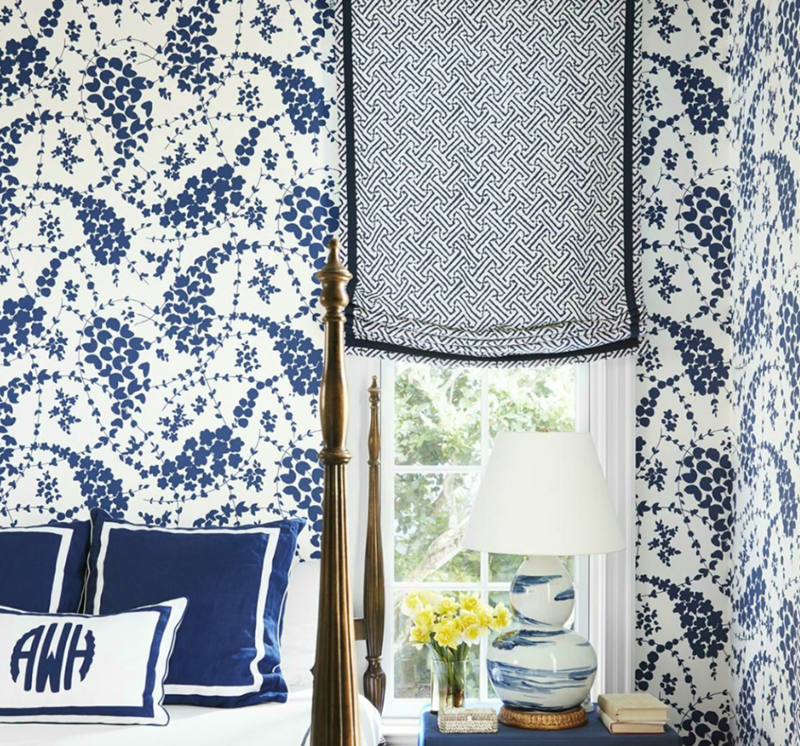 In one of my guest bedrooms I have chosen a Ralph Lauren blue grasscloth wallpaper as a backdrop for blue and white accessories. The living room is a creamy yellow with lots of blue accessories, lamps etc.. The kitchen is white with blue accents. Thank you for sharing the photos today. 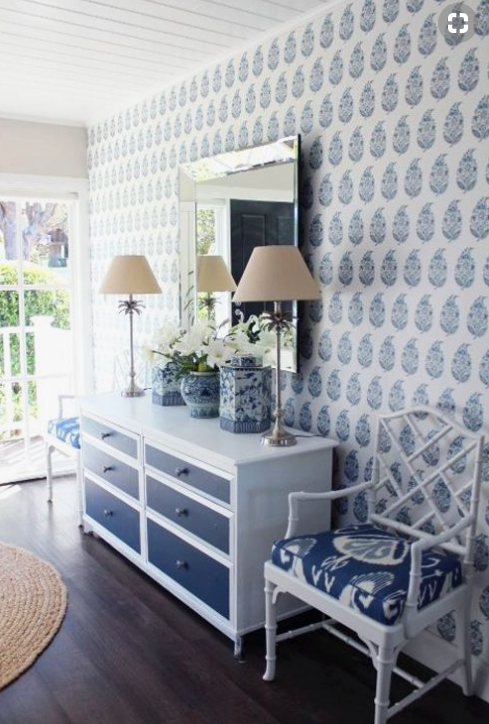 Love love love the blue and white wallpaper and I have used it in a cottage bedroom. It was so fun to wake up to bright sun shining into the room and I would do it all over again. Loved every picture. My home is less formal, but I appreciate good sense of design. Thank you for sharing! Every room so beautiful. 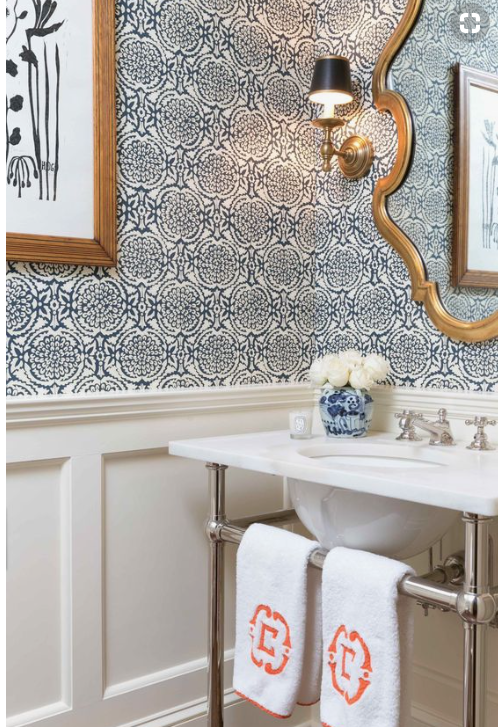 I think wallpaper in a powder room and dining room are especially beautiful. 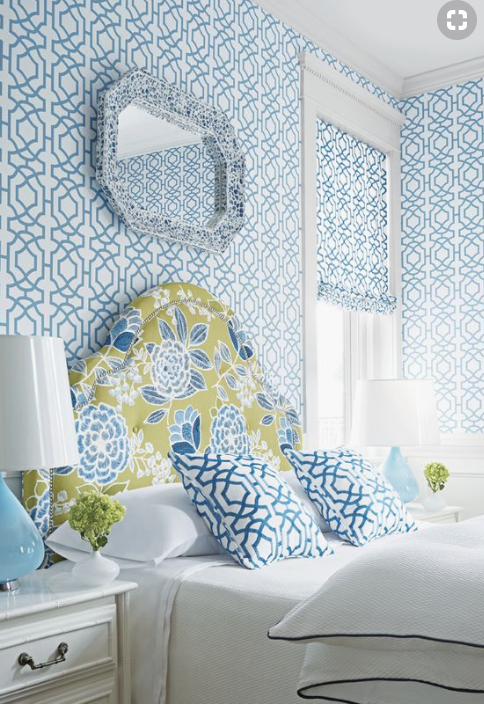 We are moving in a new house in Oct and I would love to do a bedroom in blue and white. Thanks for the good ideas. Love Love Love! 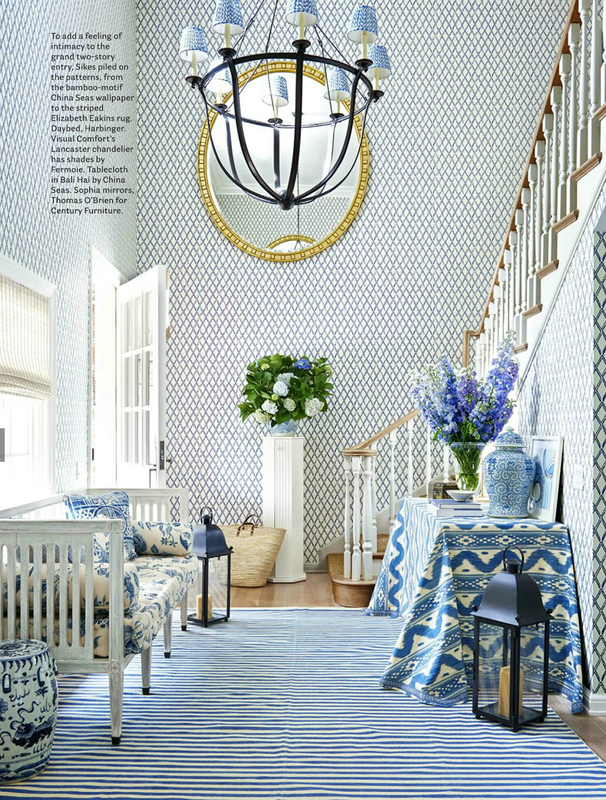 Blue and white is so crisp, simple and elegant. Love these pics…ALL are simply fabulous! Over the moon with the post. Blue and white heaven. Thanks for sharing the beautiful pictures. I am soooooo glad to see wall covering back in style!!!! Love, love every room!!!! I also love the companies you suggested….can’t go wrong with selected from these companies!!!! This was a fun post. 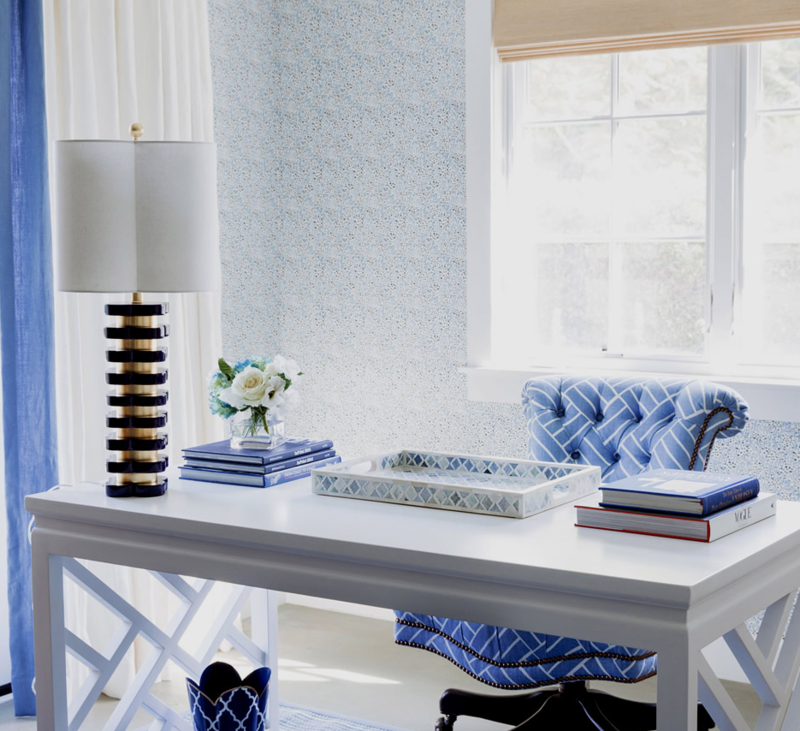 Swoon worthy blue and white papers which I think, never go out of “style”. Thanks for the inspiration. 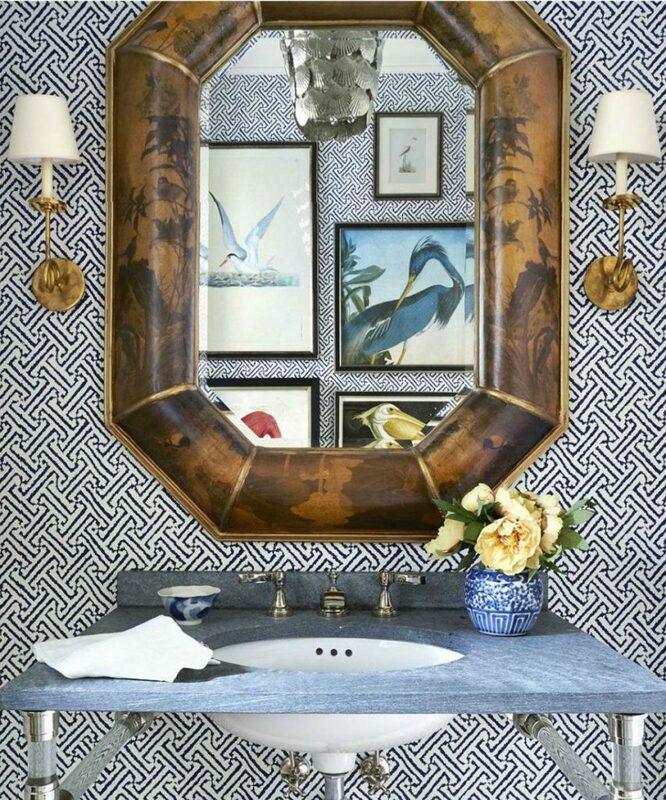 My powder room may soon get a bolder look! 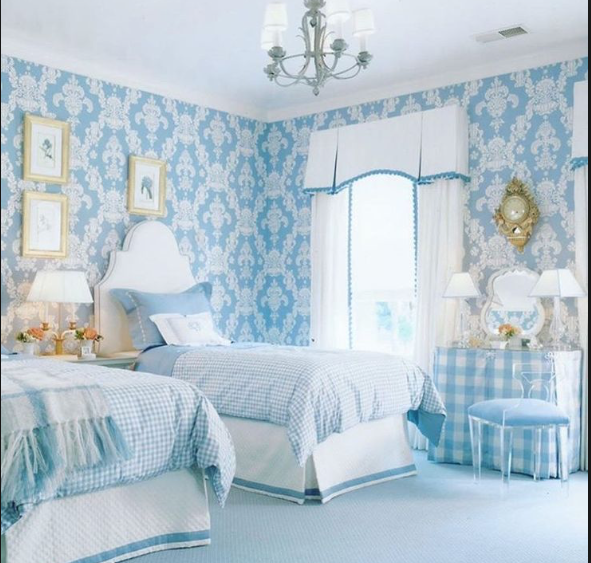 Each room is gorgeous! 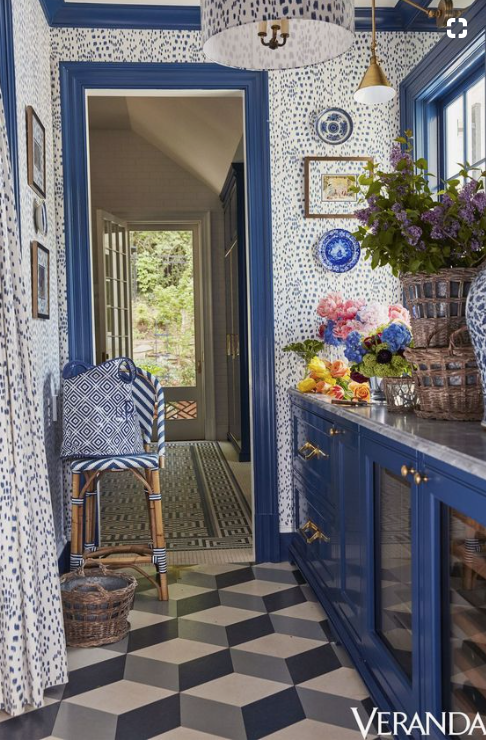 I like the bold looks featured in the smaller rooms such as the laundry room, bar/potting room, and the Sarah Bartholomew foyer. 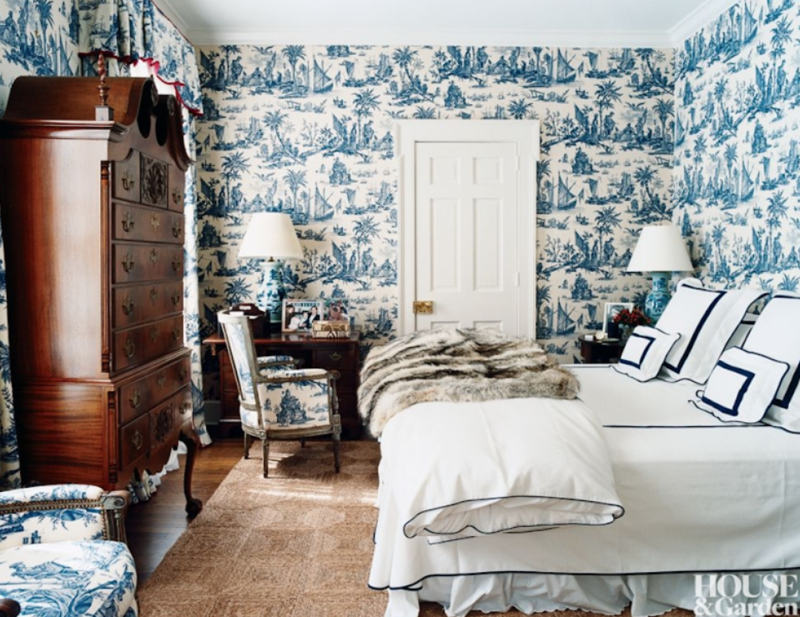 My favorite, though, is that timeless bedroom from House and Garden. Thank you for this inspiring post! Thanks for the fix. I needed that! Blue has always been my favorite color. All my prom dresses were blue. 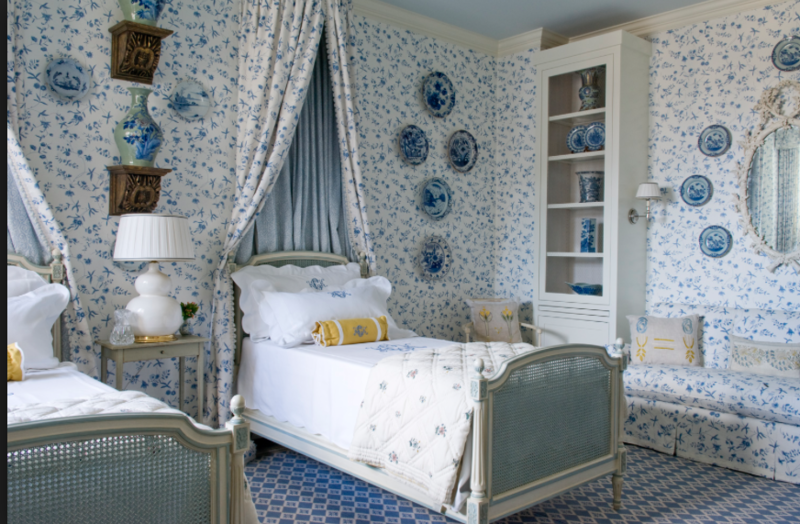 My bedroom is in blue and white and always has a serene feeling when entering in it. 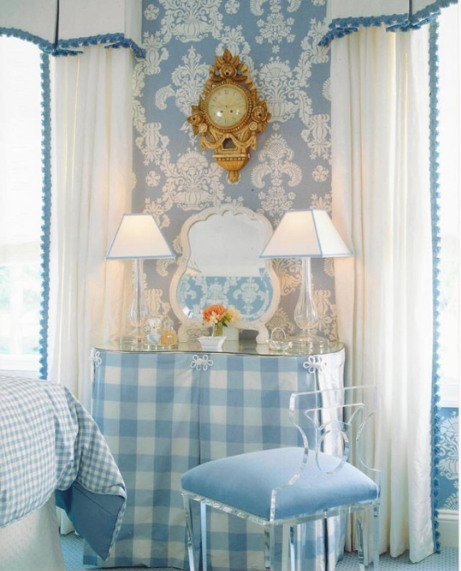 My wallpaper is a baby blue moire and looks beautiful. I do like the softer tones. Count me in the blue and white club! What a fabulous post!! 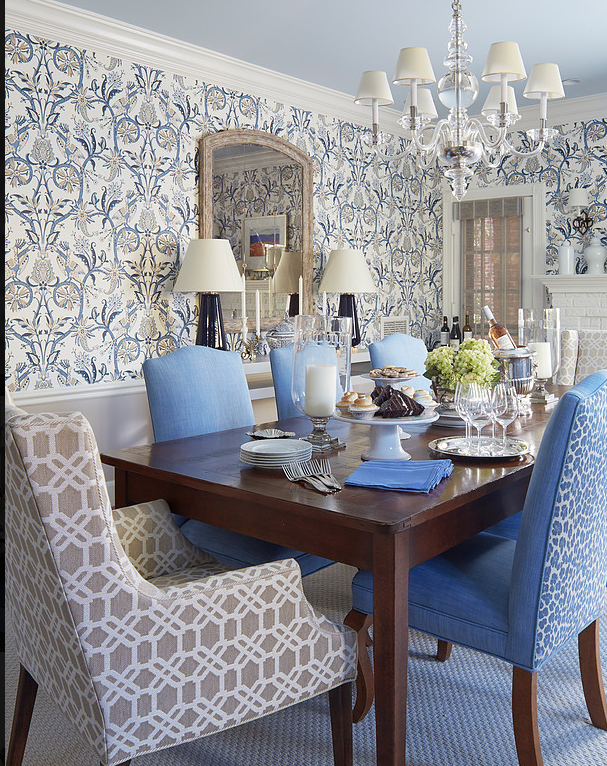 Love everything blue and white! So many yummy images. This is an incredibly timely post for me. 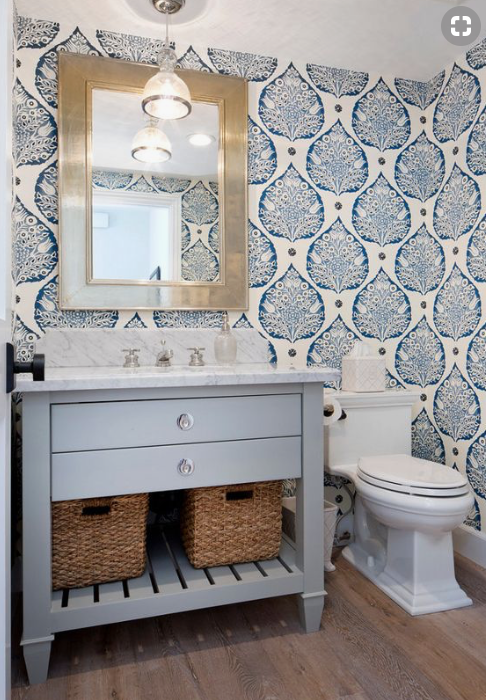 I just started gathering design ideas for a powder room make over. 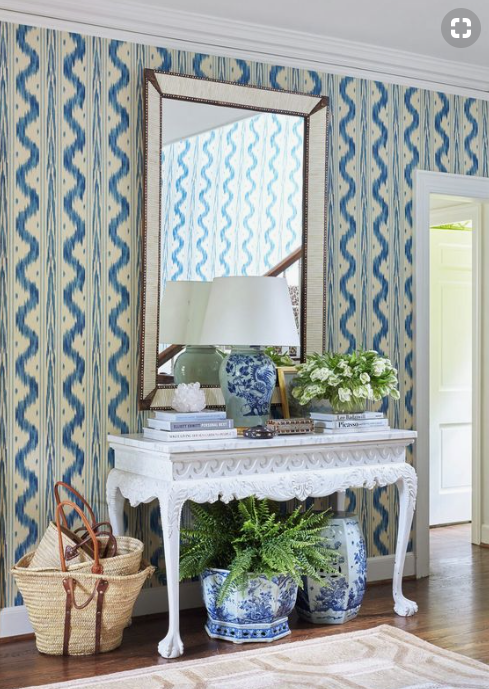 I’m thinking a beautiful blue and white wall paper would be gorgeous. Thank you for sharing! 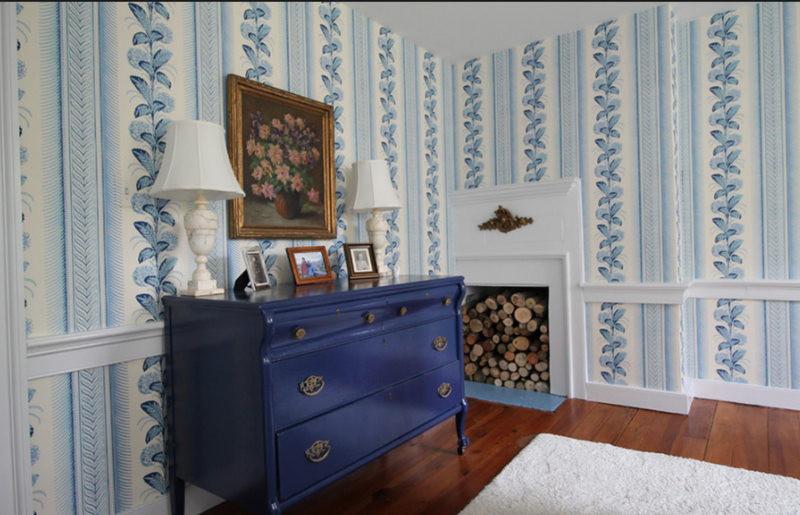 Favorites are chinoiserie mural paper by Gracie and the traditional bedroom with high boy/Home Garden. Oh so fun seeing all the blue and white. Hi Tina! Gorgeous photos all!!!!! What is the source of the paper in the 12th photo? I have a bathroom if would be perfect for. I also want to thank you for your info about LaPrarie. I now have blue jars lined up on my vanity and absolutely love the products!!! Oh, my, the Mark D. Sikes foyer. Love It! 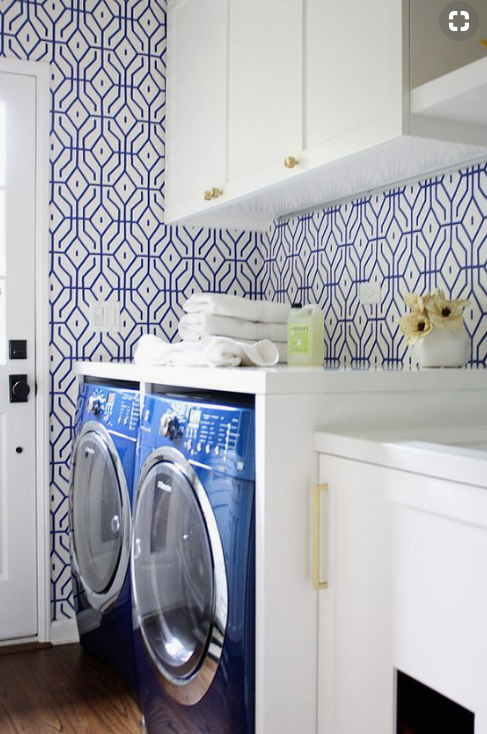 I especially like the laundry room! Love, love, love blue and white. No limits-anywhere and everywhere! 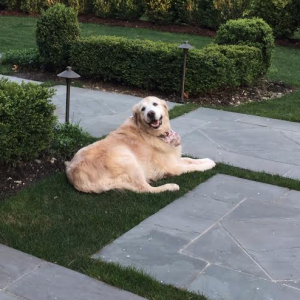 Tina, oh so beautiful! I have the 12th one down ( marble bath pic) in a powder room. I have really enjoyed it! Wow! 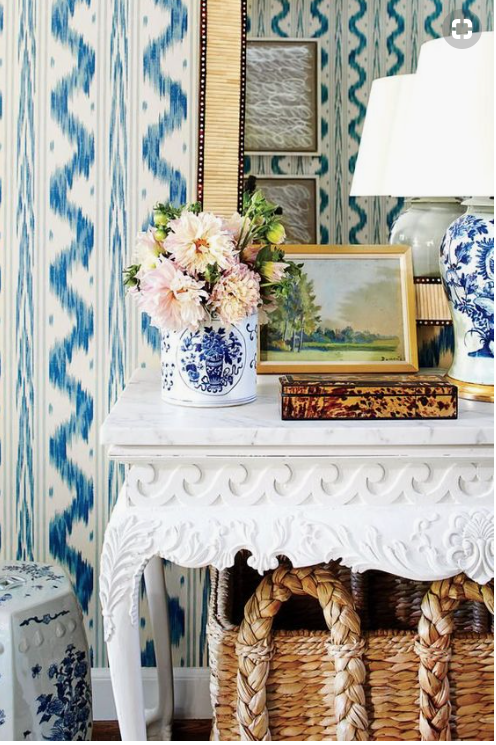 These pictures are making me fall in love with wallpaper again!! O my goodness! Just catching up to this treat today! As a committed ,confirmed member of blue and white clubbers, this post – from opening gasp to the blissful sigh at the last was just heavenly! Mark D. Sikes, Cathy Kincaid, and Sarah. Bartholomew are favorites.. 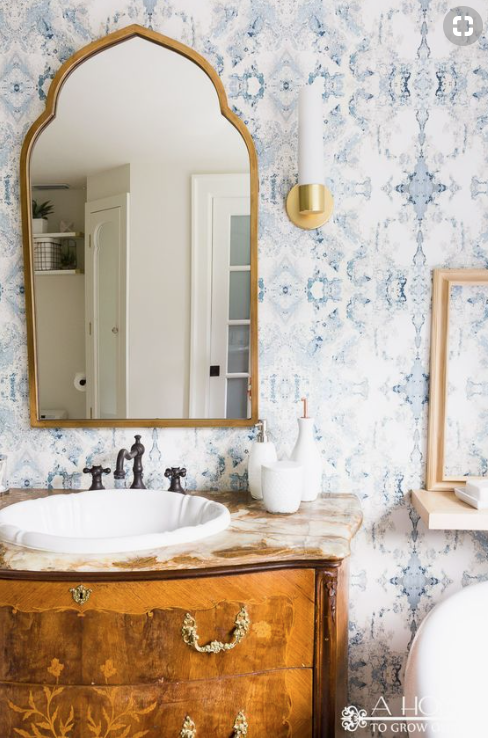 Loved it all.I have a similar blue paper in my bathroom,as the marbled bath shown, and would have it in my bedroom too If I could! 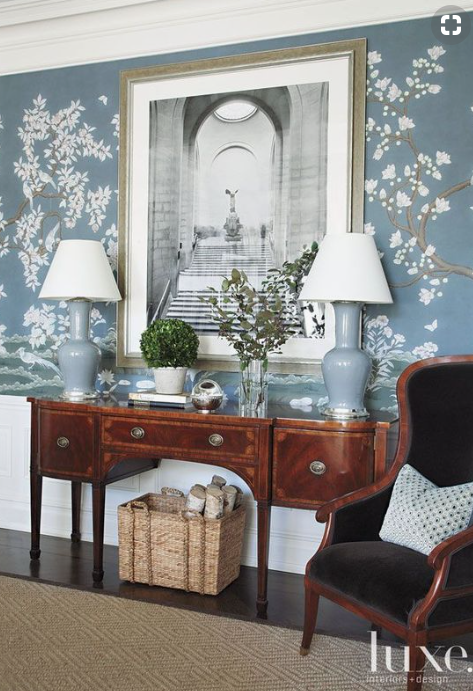 I grew up in a home filled with wallpapers.. ….there is nothing like it ..and I am loving its revival.